Hello darlings!! Can you believe January is almost over?! It's so crazy--2017 needs to slow down! Over the last weekend I took part in the Women's March on Denver and it was fantastic! I had such a great time with my family and friends and it was so inspiring to see so many people show up and unite! In the meantime, the outfit I've styled below is what I have been LIVING IN because it's so comfy, warm and easy to slip on! I found this cardigan at Nordstrom rack and absolutely love it! I was looking for an over-sized cardi that was somewhat fitted so it wan't too engulfing- and then I found this Willow & Clay one! It runs large (I'm wearing a small) so if you want a smaller/not as over-sized fit I would get one size down. I wore my fave BP long sleeve top underneath and decided to pair it with my faux leather leggings to break up the all black look with a different texture and finish. 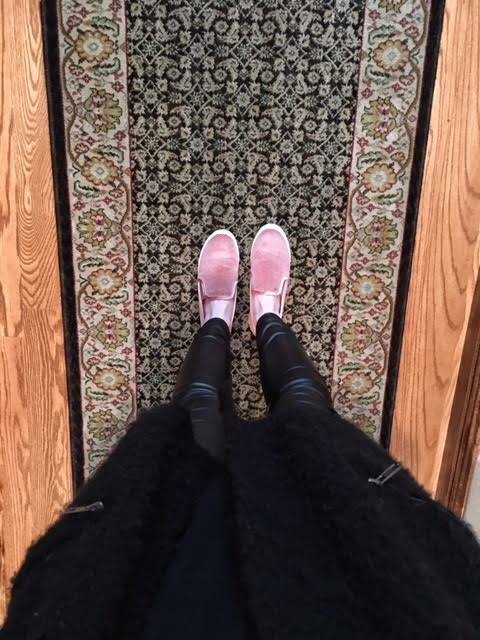 I added my new blush pink slip on's (under $40!!) that I love and add even more texture and a pop of color! Enjoy! Did you participate in the Women's March? Comment below with which city! Miss a post?! Follow me on Bloglovin' to stay in the know!